Clean Slate Bill will help addicts obtain jobs. How can citizens get involved to help with drug epidemic? How to recognize if someone is using heroin/opiates? State Senator Gene Yaw hosted a special conversation for his constituents to specifically address opioid and heroin addiction. Pennsylvania is leading the nation in drug overdose deaths, especially in young men. 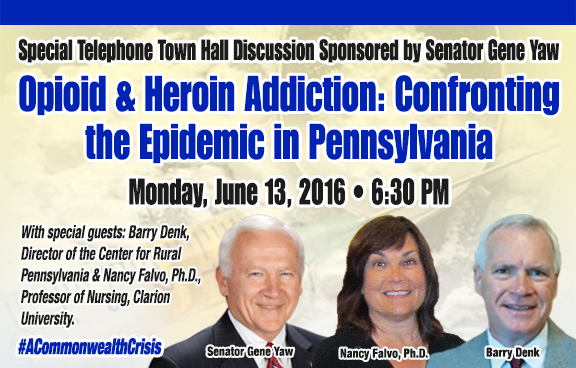 The Senator and his guests, Barry Denk, Director of the Center for Rural Pennsylvania, and Dr. Nancy Falvo, Professor of Nursing, Clarion University, talked to callers about community driven programs to help prevent and deal with the epidemic. Listen as they discuss the availability and use of Narcan/Naloxone to help overdose victims. Multiple aspects of the overall problem were discussed from reducing access, the efficacy of methadone and other treatments, and how to monitor the use of opioid medications for those who legitimately need them to help with chronic pain. The panel also discussed the mental health issues that contribute to drug addiction.